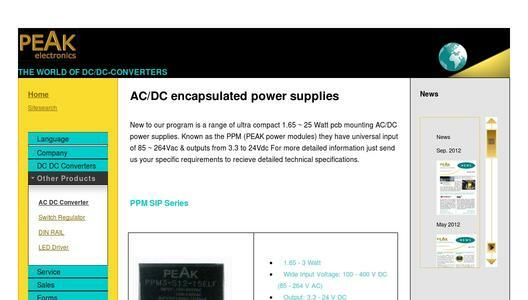 PEAK electronics has expanded its proven AC/DC power supplies, known as PPM or PEAK power modules, with power ratings of 2 W, 5 W and 12 W with two new converter versions with 10 W and 20 W. Depending on the type, the modules deliver an output voltage of 3.3 V, 5 V, 9 V, 12 V, 15 V and 24 V DC. The main features of the PPM series include a universal input of 85 to 264 V AC or 120 to 370 V DC at 50/60 Hz, low ripple and noise of 50 mV typical and high efficiency. Dependent on the output voltage, the most powerful 20 W modules type PPM20-E-xxELF have a high efficiency of 74 to 83 percent and the 10 W modules type PPM10-E-xxELF have an efficiency of 70 to 80 percent. 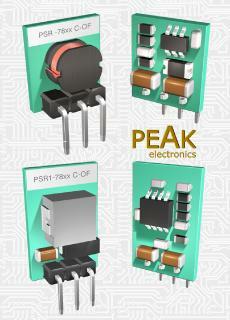 The PPM series of power supply modules is also available in a compact E package. The package dimensions are 53.50 x 28.50 mm and the height of the module varies depending on the power. 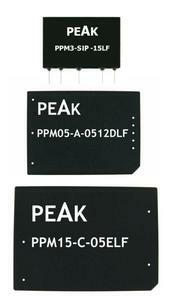 The 20 W PPM20-E-xxELF converters have a height of only 23.50 mm. The AC/DC converters are designed for printed circuit board mounting, but they can also be provided as DIN rail modules. 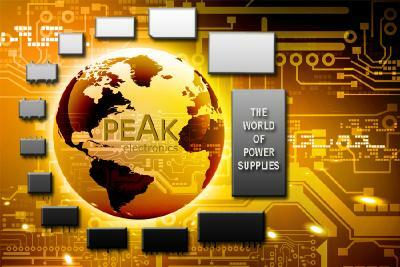 PEAK electronics is certified according to ISO 9001:2008 for the development, production and sale of DC/DC and AC/DC converters.